Use the Husky 1/8 in. to 2-1/8 in. Quick Release Tubing Cutter to make clean, square cuts on copper, brass, aluminum and thin-wall conduit (all sold separately). This tool features a convenient quick adjustment button to facilitate fast size adjustments to various sizes of tubing. Fine adjustments for cutting can also be made using the knob at the base of the tool after the quick adjustment action is performed. An Extra Blade is included and can be stored in the Knob. The Tungsten Carbide Cutter is perfect for use in shaping, smoothing and material removal. This cutter can be used on hardened steel, stainless steel, cast iron, non-ferrous metals, fired ceramics, plastics, hardwoods and other hard metals. The Tungsten Carbide Cutter is intended for use for shaping, smoothing and material removal. Use on hardened steel, stainless steel, cast iron, non-ferrous metals, fired ceramics, plastics, hardwoods and other tough materials. 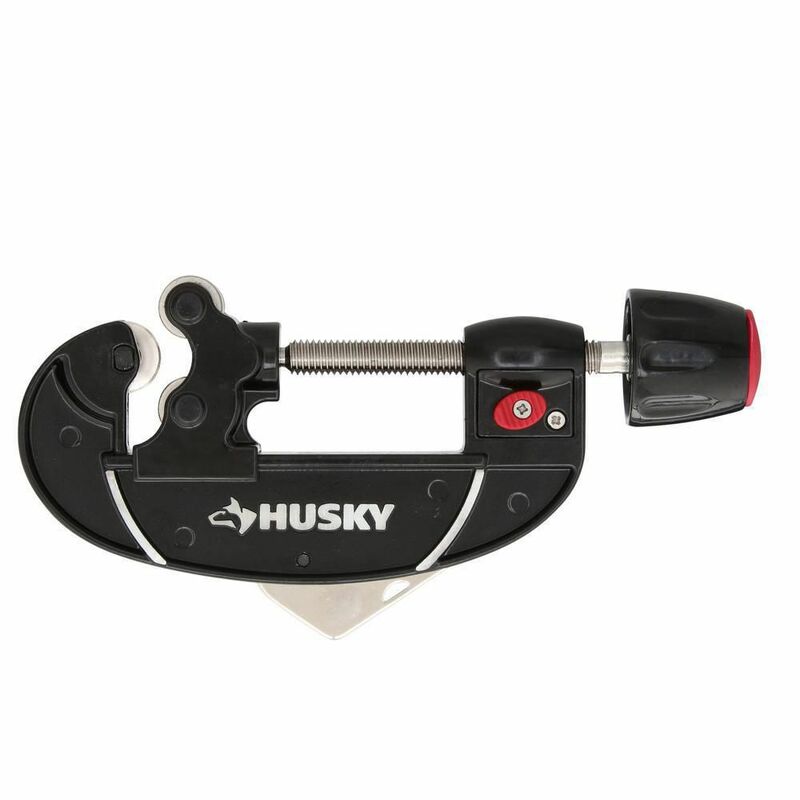 Quick Release 2-1/8inch Tube Cutter Use the Husky 1/8 in. to 2-1/8 in. Quick Release Tubing Cutter to make clean, square cuts on copper, brass, aluminum and thin-wall conduit (all sold separately). This tool features a convenient quick adjustment button to facilitate fast size adjustments to various sizes of tubing. Fine adjustments for cutting can also be made using the knob at the base of the tool after the quick adjustment action is performed. An Extra Blade is included and can be stored in the Knob. Quick Release 2-1/8inch Tube Cutter is rated 4.5 out of 5 by 148. Rated 2 out of 5 by HomeDepotCustomer from Too heavy and bulky to be practical.... Too heavy and bulky to be practical. Rated 4 out of 5 by Michael from Not too small, not too big, just right!!!... Not too small, not too big, just right!!! Rated 5 out of 5 by gmart68b from Worked great for the purpose of cutting some 1.5" ID... Worked great for the purpose of cutting some 1.5" ID galvanized steel pipe. Figured the blade would be dull after that, but used it to trim up some CPVC, as well, for another project. Clean cuts on both.